With its ergonomic design and adjustable steam settings, this lightweight iron makes pressing clothing and linens quick and easy. The automatic cord reel system allows the cord length to be adjusted as needed, so it stays out of your way as you iron; the cord also completely retracts for tidy storage. A built-in thumb rest on the handle ensures more comfortable ironing, and its precision tip reaches difficult areas. Auto shutoff after 8 minutes if left vertical, after 30 seconds if left horizontal or tipped over. Built-in Anti-Calc system removes impurities, ensuring long-lasting, clean steam. Patented Microsteam stainless-steel soleplate has 300 microholes for perfect steam distribution. Precision tip reaches difficult areas like collars, seams and around buttons. Variable steam is adjustable for different fabrics and thicknesses. Vertical steam removes wrinkles from hanging garments and drapes. Automatic cord reel allows cord length to be adjusted or completely retracted for storage. 12 1/4" x 5 1/4" x 6 1/4" high. 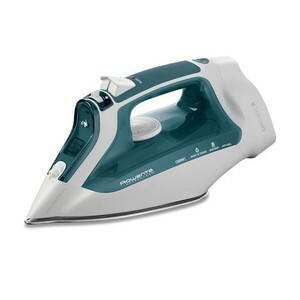 Rowenta Steam Irons, Garment Steamers, Ironing Boards, Vacuum Cleaners LPS Lowest Price of the Season!